An evening talk by Tim Pankhurst, Plantlife’s Regional Conservation Manager. Tim will talk about the origin and ecology of the Ouse Washes from a plant ecologist’s point of view. Not only are plants an important element of the wildlife interest of the Washes, they are bound up with the fate of all the other wildlife; they also tell us about the nature of change, can help decide how to address it and provide useful ways of monitoring the effects of management. All welcome. 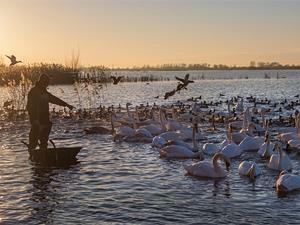 Funds raised go towards WWT's work at Welney. Cost: £3 (£2 Friends of Welney Members). £3 (£2 Friends of Welney Members).